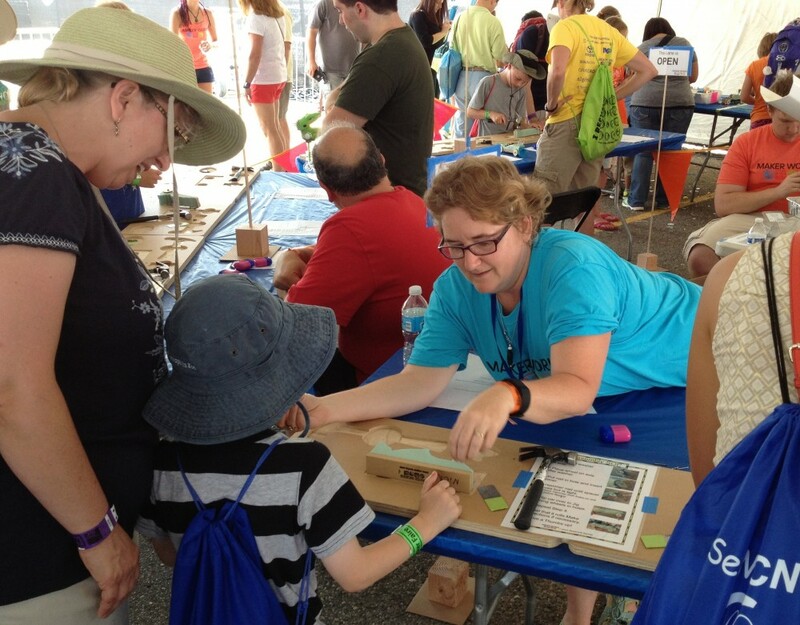 Maker Works can work with you to create an activity to match the interests and ages of your attendees. Many of these activities can be done at your location or ours. See below for just a few of the many options possible--or come up with your own! Sandcast beautiful objects in pewter. Create your own model, or we can take your logo and create a model for you. Attendees will pack foundry sand to make the mold, then a staff person will pour molten pewter in their mold before their very eyes. After a couple of minutes to cool, the part is removed, sand brushed away, extra metal cut off, and an optional hole punched for a keychain or necklace. Appropriate for all ages, but younger attendees will require supervision when using hammers. Assemble, decorate, and fly laser-cut airplanes cut from foam-core board. Can be customized with laser-engraving or custom ink stamp. Planes can be cut while you watch when the event is held at Maker Works. Can be a fairly fast activity, or drawn out with decorating and racing. Your attendees can solder a simple or even complex project. A blinking LED pin might take 10 minutes, while soldering an FM radio kit could take 1-2 hours. We use very nice Metcal soldering irons, and have staff that have run many learn-to-solder experiences. There are many simple electronic kits available that could be used. With enough notice, we can create custom learn to solder pins. For medium to large groups, the Great Maker Race is a fun activity for all ages--in fact, adults seem to have even more fun than the kids. The Great Maker Race requires a fairly large space, and depending on the age of the attendees, a fair number of people to staff. See the Great Maker Race page for more details.